Ned Ellis of Maple Leaf Farms, Red Wing Software customer, was featured in the story, Growing your Own Forages Must be Well Planned, in the May 7th, 2017 issue of Progressive Dairyman. The story is about dairy farmers and growing their own forage. Clay View Dairy LLP was featured in the story, Teamwork a Key to High Production at Clay View Dairy, the May 13th issue of Dairy Star. In the story, employees at Clay View Dairy share their insights about maintaining an efficient team. Red Wing, MN -June 6, 2017- Red Wing Software has released version 11, for all CenterPoint products, including CenterPoint Accounting, CenterPoint Accounting for Agriculture, CenterPoint Fund Accounting, CenterPoint Payroll and its associated CenterPoint Time Clock, and CenterPoint Depreciation. A significant number of new features and enhancements have been added to CenterPoint Products in version 11. The user interface has been improved for all reports, to make modifying filters and formats more efficient and simple. The Income Statement has been modified to allow for more robust and flexible reporting options. A function has been added for customers to import transaction and maintenance screen data from outside sources. A function has been added for customers to recall General Journal entries. CenterPoint for Agriculture only: Reporting options have been updated to meet the latest Farm Financial Standards Council updates. Other improvements in technology and efficiencies have been made, as well as known issues fixes. CenterPoint Time Clock now has several exciting new features, including: the ability for employees to request time off, automatic handling of employee breaks to clocked activity, and user-definable rounding of clocked entries to exact minutes. CenterPoint Payroll has the ability to configure the automatic calculation of overtime pay at various rates by period or day and break pay adjustments can now include the earnings for a specific state. New features and enhancements have been added that include improvements in technology and known issue fixes. Red Wing Software, Inc. develops, integrates and supports the accounting and financial management needs of small- to mid-sized businesses, agribusinesses, non-profits, and municipals across North America. For more information on Red Wing Software products, including CenterPoint Accounting, CenterPoint Accounting for Agriculture, CenterPoint Fund Accounting, CenterPoint Payroll, CenterPoint Depreciation, and Red Wing Tax Forms, call 1-800-732-9464 or visit www.redwingsoftware.com. Mike (Quality Assurance Manager) and his dad have been working with his daughter Kadence and some of her 6th grade class, building three little libraries as part of a service project for their community. Employees at Red Wing Software are cleaning their book shelves at home to contribute to the libraries. Katrina (Administrative Assistant) enjoyed Mother’s Day with daughter Kyla and a ride in “The Beast” (the truck her husband restored and drag races). Ashley’s (Technical Support) daughter Paytin had her dance recital. She participated in jazz, ballet, hip hop, lyrical, and tap. 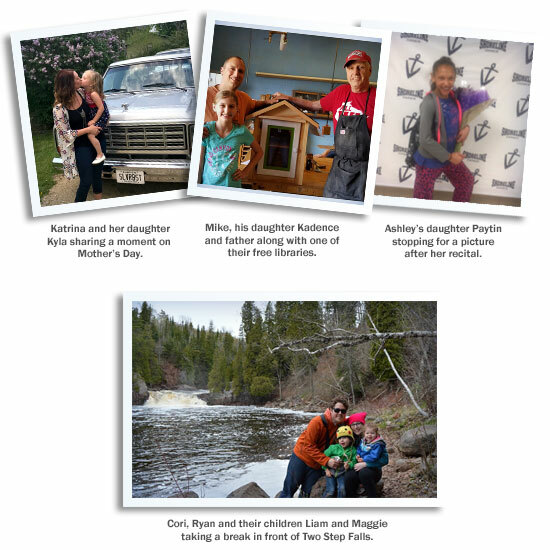 Ryan (Graphic Designer), Cori (QA Analyst) and their children Liam and Maggie went hiking at Tettegouche State Park while vacationing on the north shore of Lake Superior with Cori's family.